Do you have what it takes? Find out. You just might! 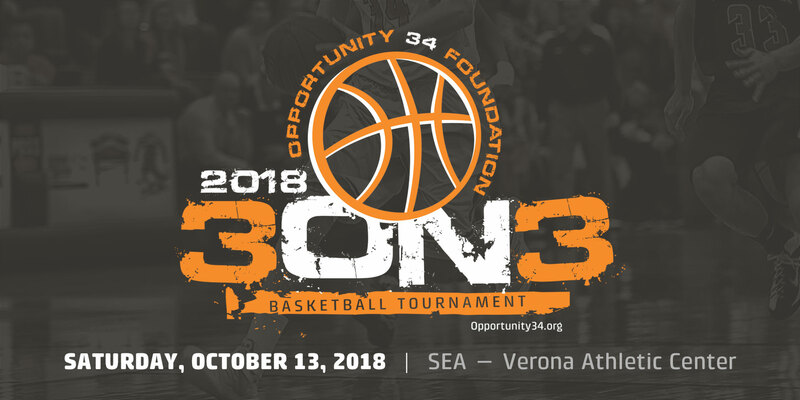 October 13, 2018, is the 1st Annual Opportunity 34 Foundation 3-on-3 Basketball Tournament. We’d love for you and your friends to be part of our first major basketball event. With our sponsors helping make this possible, we can proudly say 100% of your registration fees will go toward the Opportunity 34 Scholarship Fund. That’s amazing! 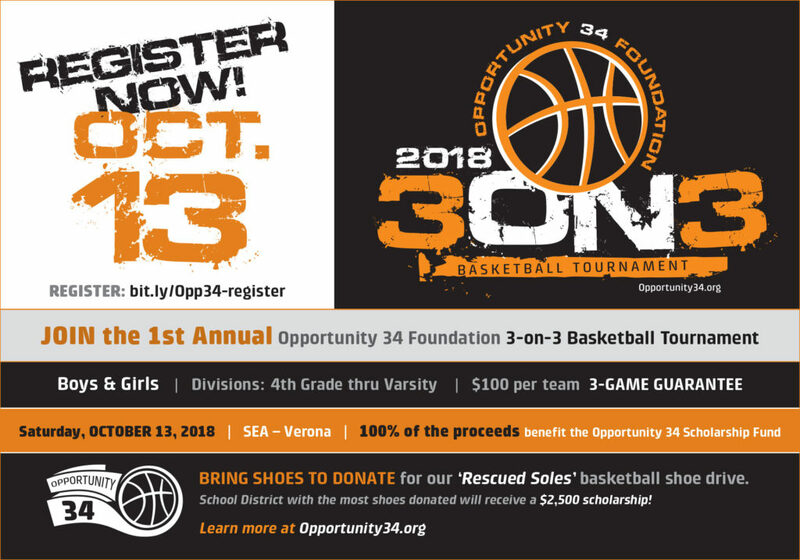 The Opp34 3-on-3 tournament is open to boys & girls with divisions from Youth thru High School, and also for adults with women’s mens, and co-ed divisions. Details and registration can be found at the SEA – Verona website. Tournament games will be held at SEA – Verona Athletic Center, 411 Prairie Heights Drive, Verona, WI 53593 (view Google map). We’ll have 8 courts going, 20 minutes per game. Teams consist of 4 players each. Registration fee is $100 per team (again, 100% of the proceeds will go directly to the Opportunity 34 Scholarship Fund). Game schedules & updates will be available on the SEA app. Space is limited, some divisions are nearly sold out so register today! REGISTRATION IS OPEN UNTIL 5PM ON MONDAY, OCT. 8. In an effort to better the basketball community we all love so much, please consider making a donation of shoes to our “Rescued Soles” Basketball Shoe Drive. We encourage you to pay it forward by bringing us your “gently used” or like-new basketball shoes to ensure as many kids as possible have an opportunity to play with quality basketball shoes. When you drop off your shoe donation, let us know which school district you are representing. When all donations are in, we’ll award a $2,500 scholarship to your district from the Opportunity 34 Scholarship Fund! Donate early, donate OFTEN!